The digital transformation affects every sector, including the banking and financial industry. 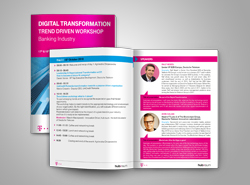 That’s why Deutsche Telekom presents an exclusive and unique workshop event for top banking executives and managers. Learn all about the digital and technological trends that are going to be shaping the future of the industry, along with the innovative companies driving this digital transformation and how they can benefit you and your business! Ralf Nejedl is Senior Vice President B2B at Deutsche Telekom AG Europe, a role he took on in January 2017 and in which he oversees the Group’s European B2B business. In this position, Ralf drives new growth areas like the IoT and smart cities, ICT and cloud-based services, as well as digitalization for business customers. Until the end of 2016, Ralf had led the B2B Sales & Service organization at Deutsche Telekom AG Europe. Before this, he served as Managing Director of T-Systems Belgium for almost three years, from March 2008 until the end of 2011. Earlier in his career, Ralf had already held various management positions since joining the Deutsche Telekom Group in 2001. Marco Cravario was born in Turin, Italy. At present, he coordinates UniCredit Group’s banking activities in Romania, as Deputy CEO. After 10 years in audit & corporate finance advisory, Marco joined UniCredit. With a banking experience of over 17 years, he covered various positions, such as GM UniCredit Bank Slovakia, CFO Yapi Kredi Bank Turkey. Marco has an Economics Degree from the University of Turin in Italy and attended management and finan¬cial programs in various schools including LSE & INSEAD. He has also been professor at the Master in Finance, Insurance and Risk management of the Institute Carlo Alberto, University of Turin in Italy. Daniel started his professional career in 2005 at Ernest & Young, where he worked in Transaction Advisory Service and Audit departments. In 2008, he joined the Siemens Group. He held various management positions such as Strategy Consultant, Head of Global Resource Management and Director Leadership Development (LD). At Siemens Daniel found his passion for leadership development and organizational design. Daniel set-up a global LD Expert Team and designed major people development instruments. Furthermore, he drove the definition of new Leadership Culture Principles and facilitated LD interventions and initiated a culture change process within Siemens. In 2015 he joined Deutsche Telekom Group as Vice President for Top Executive Development. Driven by his personal mo¬tivation he since then works on development formats for business leaders, managing directors and CXO’s. Within those he follows his strong beliefs on self-development through mindfulness and self-re¬flection. Arthur Keleti has worked for T-Systems Hungary since 1999, currently as an IT Security Strategist. As author of the book titled “The Imperfect Secret”, he is an active researcher of security of personal and business secrets present in the cyberspace and of the future of this field. As the inventor and organizer of the 14 years running “Info/Cybersec, Trends, Buzz & Networking” (ITBN) conference he has a comprehensive picture of the entire Hungarian and CEE IT Security market, and makes his best efforts to actively assist in its development. With respect to his market activities, after some time spent working for the Hungarian Foreign Trade Bank he joined EasyCall from where he switched to KFKI, as division director for ICON’s IT security department. He is the founder and president of the Voluntary Cyber Defence Collaboration. Earlier he worked on the development, design and music of video games. v-Banking founder. Member of External Network & Alternative Channel Committee. More than 20 years of experience at retail banking (ex member of Network Executive Committee) with demonstrated history of financial services industry. Strong involvement in Eurobank retail transformation (project manager of implementation of the Hub & Spoke model, and the pilot program of micro market model ) and also to the transition to the digital era. Specialized at SMEs. Previous professional positions of responsibility at Eurobank: Branch manager, assistant head of SB segment, SB segment area manager, Senior sales SB coordinator. Adam Peter Nagy is the Head of Information Risk Management Department and Head Information Security Officer for K&H Group. He has direct responsibility for information security at K&H Group, both methodologically and operationally. Adam has one and a half decade experience in the area of IT and IT security, his main field of expertise and focus is security operational centers and log analysis. During his work experience in Hungary, he participated in the construction of the first security operational center in Hunga¬ry, worked at internet service providers and service centers, besides the banking sector; and also gained relevant experience abroad on multiple continents. He regularly holds lectures at local colleges and holds presentations at IT conferences, as well as actively participates in IT security forums. 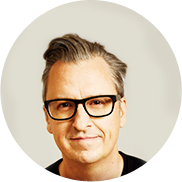 John is the Head of the Telekom Innovation Laboratories (T-Labs) and of the Blockchain Group. 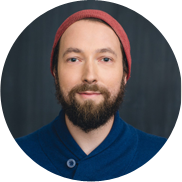 In this dual role, John is responsible for developing and leading innovation topics, including blockchain strategies and initiatives, for Deutsche Telekom and its partners. Prior to joining T-Labs, John held numerous technology leadership roles and was the founder and COO of multiple startup software firms in the Seattle area. Mr. Calian holds an MBA in Technology Management from the University of Washington. Head of Business Intelligence Department and Infor¬mation Architect. Join the Mitsis Hotels to develop the implementa¬tion and support the business information systems across multiple departments. Identify problems and opportunities within the Group and ultimately provide solutions that help achieve the business’ goals. Collaborate with financial reporting and IT team to develop initiatives and strategies that optimize costs and improve internal and external reporting. Summary of presentation: I will cover the topics like: what are the key technology trends that have a crucial impact on the banking industry, how the innovation is changing, what is the role of startups & innovators in the companies. I will also present Deutsche Telekom’s innovative capabilities and I’ll talk about the leaders role in the digital transformation of businesses. Blockchain: After the Hype is gone! Summary of presentation: Blockchain is, for sure, one of the hot technology topics of the day. The question is: what will remain when the hype is gone? Are the distributed ledger technologies holding the responses to all the technical challenges and dilemmas we have? Will the blockchain based business models bring new services on the market? Will this new cutting edge technology disrupt completely so many business sectors as it promises? At Telekom Innovation Laboratories (T- Labs) we have been studying and experimenting for more than one year on various decentralized ledger technologies and John Calian, Senior Vice President and Head of T-Labs has some responses to these burning questions! Summary of presentation: Cybersecurity could be the pillar of economic stability, the nightmare of hackers, the verge of technology, the savior of privacy, a bottomless money pit and a neverending success story. All of that at the same time. How could we find our way through of this impossibly complex magnetic field? How could future cybersecurity technologies and services like automatic event monitoring or AI in user behavior analysis contribute to FinTech or the Financial Industry? Will the 3 million missing cybersecurity professionals bring peace or more trouble to the World by 2020? And what is all that have to do with our deepest personal secrets? In highly regulated sectors like the financial, combating fraud is essential as there is a multitude of compliance, regulations, risk management measures, and monetary consequences to be dealt with. The proliferation of modern technology has produced more sophisticated fraud techniques, but technology advancements have also enabled smarter approaches to detect and prevent fraud. Applied right technologies to prevent fraudu¬lent cyber activities and to detect cross-channel anomalies in a super-fast, payment card and online transaction processing environments. Summary of presentation: In my presentation I will elaborate on what blockchain can do for the financial and banking industry and how Berlin-based fintech company - solarisBank uses this technology. Leadership and Organizational Transformation at DT: How to become a future fit company? Summary of presentation: In his speech Daniel will zoom into the challenges of leaders and organizations within our fast changing environment and how Deutsche Telekom tackles those. Coming from a broader view on current trends, he will give examples on how they are already impacting the daily work of leaders. Which will bring him to the leadership development approach at DT and insights into his daily work and thoughts. Summary of presentation: UniCredit Romania transformation towards a purpose driven organization is meant to show how we developed a coherent and relevant story, adopted in daily life as a powerful system to stir the transformation. 7 Innovators: Personetics, Softomotive, IDnow, BehavioSec, CloudStorm and WalkMe will present their innovative solutions which will help the banks to improve clients experience, optimize bank's operations and maximise bank's revenue & profit. How to become a future fit company? To spot emerging trends and to recognize the expectation gaps that herald opportunity. The workshop helps to match trends to the appropriate technology and environment of your organization. By the right identification, you will evaluate different external factors which give impact. Parameterization will determine the impact of a given trend in your industry and how it is ready to be implemented. AI Proactive & Personalized Digital Engagement Platform which enable financial institutions to engage customers with personalized insights, timely advice, contextual services & self-driving finance. Personetics harnessing the power of AI to transform digital banking into the center of the customer’s financial life. Personetics is currently serving over 30 global financial institutions with 50MM+ customers worldwide. Softomotive provides the smoothest RPA journey by making it easy to start small, learn quickly and scale seamlessly, trusted by more than 7,000 companies globally. Softomotive delivers powerful and robust Attended and Unattended RPA technology, ranging from self-contained, user-driven desktop automation to a distributed, server-based enterprise RPA solution which is quick to deploy, easy to use and provides best-value for money. As the European market leader IDnow means one thing: Identity-as-a-Platform. From our fully-automated AutoIdent to video identification, eSign and Software-as-a-Service, IDnow offers a uniquely diverse and exciting range of identification solutions. Whether it is telecommunication, financial services, insurances, eCommerce or the sharing economy; IDnow offers safe, compliant and easy solutions for every use case”. BehavioSec is the first vendor to pioneer Behavioral Biometrics for the enterprise at scale that can support billions of transactions and millions of users. BehavioSec’s Behavioral Biometrics software is a new method that transparently and continuously verifies human digital identity across mobile and web apps. CloudStorm makes robotic process automation (RPA) accessible for the enterprise market. With enterprise-wide software integration and a unique process discovery approach, CloudStorm becomes the first RPA to offer "robots as a service" for companies of all sizes. WalkMe is the pioneer of the Digital Adoption Platform — an enterprise-class guidance, engagement, insights and automation platform that provides users with the right information exactly when they need it. WalkMe boosts employee productivity and customer engagement, allowing businesses to fully enjoy their digital assets. WalkMe’s DAP is used by over 1,000 enterprises across all industries. DataSine was founded in 2015 with the mission to make customer experience more compelling, more personal, and more informed. Through our AI-powered platform, companies can understand their customers as individuals and personalise content at scale - building engagement, loyalty and trust.